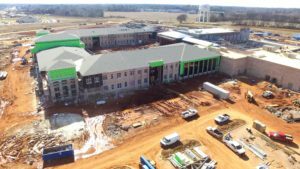 You may have noticed, but a lot has changed with the new Athens High School building over the past several months. Piece by piece, the new facility is starting to come together as an average of 225 workers are on site each day. As the weeks pass, the structure gets closer to being fully under roof. We anticipate 95 percent of the building will be under roof by the end of March. Notable progress is also taking place in the interior. Finishing in several areas of the building, including ceiling systems, gypsum wallboard, paint and even hard tile are underway. In the courtyard, brick veneer and stone masonry continue. Hardscapes and landscaping are scheduled to begin in the courtyard by April. 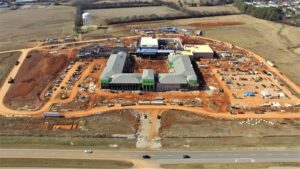 Construction of the new Athens High School, led by Athens-based Martin and Cobey Construction, remains on schedule.